Wood stain has a distinctive odor that may be a bit off-putting in close quarters after you've finished working on a project. In some cases, the stain may contain solvents that emit volatile organic compounds in the form of fumes as the stain dries. If you're working with stain on a project requiring that you use it indoors, ventilation and time are the best ways to eliminate the odor completely -- the stain will eventually stop emitting gases that contain the odor. Open all the windows in the affected area, and any windows or doors in adjacent rooms that would allow for a cross breeze. Place a box fan or window fan in windows or screened doorways at opposite ends of the room -- one fan to draw air in, one drawing it out. If there's a breeze outdoors, use the fans to guide the air in the same direction as the breeze. For instance, if wind is blowing into the house on the south side, the fan on the south side should draw air in while the fan at the north side pulls air out. Note: Let the stain dry to the touch before introducing a lot of air into the room, as strong airflow can pull in or raise dust and other particles that can mar the stained surface. 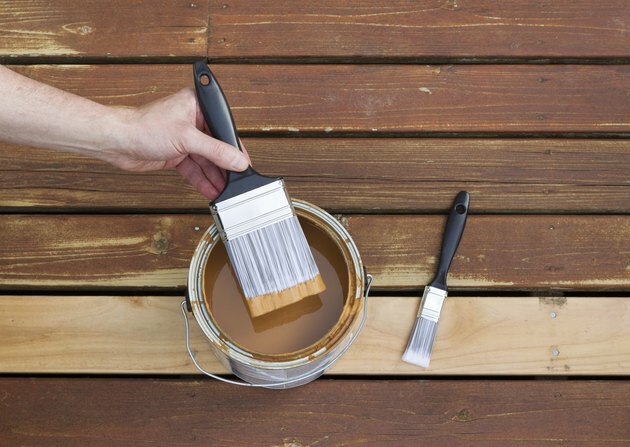 Cart the freshly stained wood object outdoors, if possible, to air it out while drying. A dry, non-humid day helps eliminate the lingering stain smell.